As I roll across the Southwest with the cruise control on I see incredible vistas and postcard colors all unfurl before me like a movie about my life I am starring in. 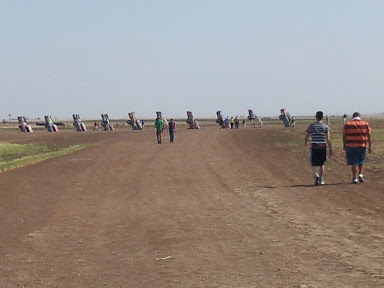 My first day driving alone finds me heading east on the 40 towards Amarillo Texas across the New Mexico sands. Beautiful reds, pinks and oranges abound in the deserts and cliffs under the hot sun. Passing signs for Indian fry bread, moccasins and other assorted native American offerings I see a cliff with an assortment of tepees spread over the edge looking down on the gift shops below…Tepees I think? They were on the plains, shouldn’t there be a wigwam or a pueblo like the ones some families still lived in when I crossed this desert as a child? Maybe some still do but certainly not a tepee in this climate. 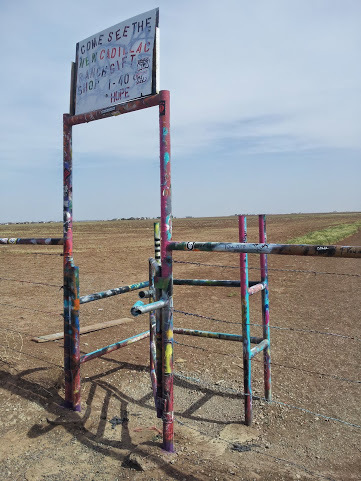 I speed on down the road and finally cross into Texas with a feeling of accomplishment. I am now further away from California and closer to Pennsylvania my destination on this journey. This sense of freedom, of being alone with my own thoughts is very intoxicating. 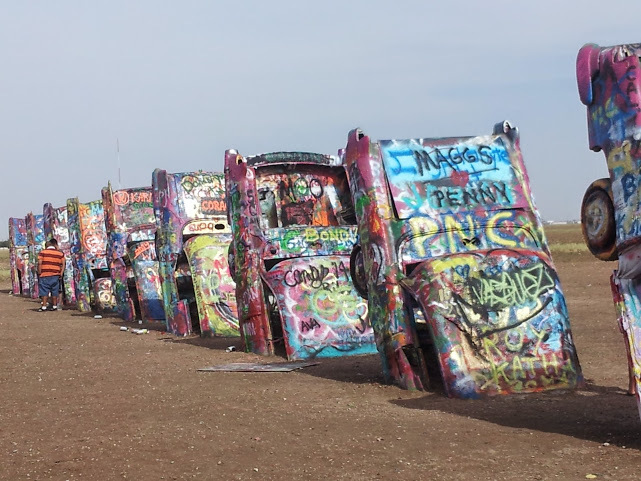 Meanwhile at the Cadillac Ranch… This art installation was commissioned by an oil heir and produced by the art group Ant Farm in the 1970’s. 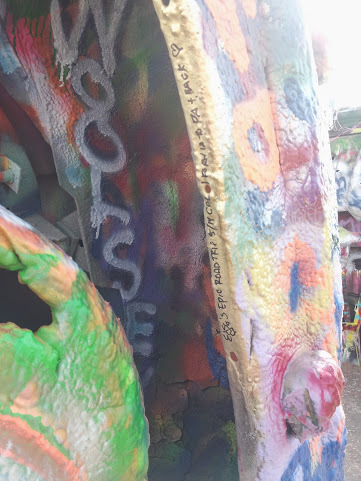 It has stood the test of time as people flock to see and unusual sculpture and write their own message or paint their colors on the many layers. When I was there most of the tourists were French and enjoyed getting their pictures taken with the oddity. My message. After this I head to my host’s home for some country music as his band rehearses in the living room before a supper of grass grown local beef and spaghetti. It really is quite beautiful to behold and sparks some interesting conversations.